Increasing cost can increase people’s appreciation of a product. 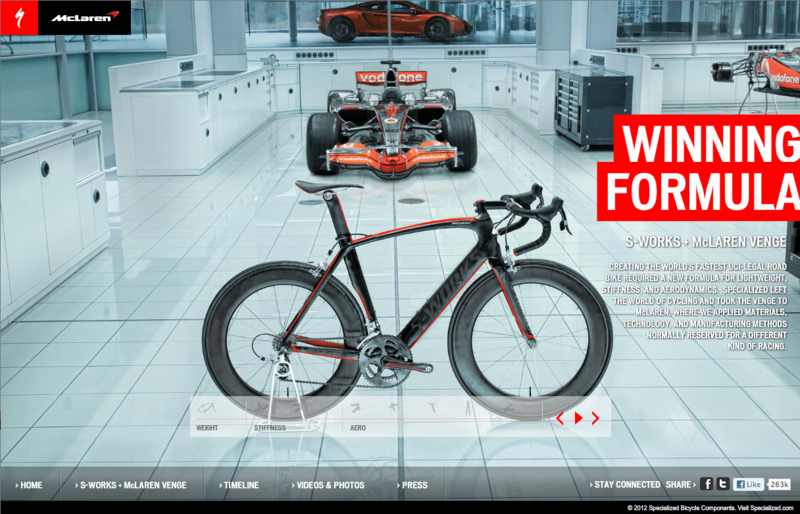 Specialized created a bike so expensive that it gets its own marketing site. The bike is shown next to a Formula 1 racecar and the McLaren supercar. It looks more like a stealth fighter plane than a bike. The S-Works McLaren Venge costs $18,000. That’s for a bicycle, not a motorbike. The average cyclist would probably actually be happier and more comfortable on a lower-end bike that was more forgiving in the corners and more flexible in its frame. So why do Specialized produce this model? They have several reasons. First, there are people out there who’ll buy the bike just for its exclusivity. Second, there is a technological trickle-down effect that sees all of the manufacturer’s other bikes benefitting from the research done on this one. Third is the psychological trickle-down effect on the bike-buying public’s perception of other models from the same company. Advertising the superbike brings brand awareness and knowledge that similar engineering is being used to build the other bikes in the line, including the ones that only cost $1,800. This psychological trickle-down is known as the halo effect. The American Association of Wine Economists found that in blind tastings, regular consumers on average showed a slight preference for cheaper wines over more expensive ones. Expert tasters in the same blind tests did tend to enjoy expensive wines slightly more, but for the average customer the findings from this study suggest that price and expert recommendations aren’t the best predictors of enjoyment. What’s interesting is that even after you read about this finding you aren’t likely to change your alcohol purchasing behavior. That’s because part of the pleasure we get from drinking wine comes from external attributes such as its price and how it is presented. When price is introduced as a variable, people tend to rate the more expensive wine as more pleasant, and it’s not just their subjective self-reports that bear this out. fMRI scans of the brain show more “pleasantness” response to the wine with the higher price tag, even when both glasses were actually poured from the same bottle. Why is this? Scarcity boosts appeal, and maybe either people associate higher price with greater scarcity or, because they can afford to buy fewer bottles, the wine will actually be scarce for them so they will savor it more. Just raising the price of a product may be sufficient, but it helps if it also looks the part: use packaging that implies the item is more scarce or valuable. Use cost as a product differentiator – make it apparent that you charge more for your item because you think it has higher quality. If your product is a luxury good that people would find indulgent, make customers aware of the cost rather than hiding it. Consumers often believe that indulging can compensate for the pain of payment. Leverage the halo effect. Other cheaper products in your line-up will receive a psychological benefit from association with the expensive product.